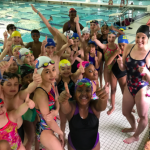 About the Author: Lee Sommers is a strength and conditioning coach and consultant to Fitter and Faster Swim Tour as well as for Nations Capital and Rockville Municipal Swim Club. He trained Olympic gold medalist and world record holder Katie Ledecky for the four years leading up to the 2016 Rio Olympic Games. He is also a director of fitness at Healthy Baller. Parents and coaches often ask me about what dry land training is suitable for age group swimmers. The answer is complicated since younger athletes vary in maturity, size, and ability. However, balance and overall athleticism are two physical attributes that all athletes must continue to develop throughout their careers. With swimming being a time-intensive, year-round sport, swimmers typically don’t have the time to practice activities that would enhance their overall athleticism. I’ve heard several well-respected swim coaches say they wish their younger athletes would spend time engaging in other sports such as soccer, gymnastics, and basketball, and I completely agree. However, many youth athletes are “specializing” in one sport and swimming is no exception. Understanding this reality, we must train our swimmers to develop their athleticism and balance utilizing a proper progression continuum. Failing to prepare is preparing to fail. If we fail to prepare our athletes with basic balance, stability, mobility, and athleticism, they will fail when we start to implement more progressed dry land training programs. So what exactly should our youth swimmers be doing when they’re out of the water? The simplest way to begin the process of improving balance is to have your swimmer stand on one leg for 30 seconds while they brush their teeth. This allows them to practice a very simple balance drill that at the same time has a nice residual effect…clean teeth. *These drills are great for developing stability and balance around the feet, ankles, knees and hips. An improved focus on this can result in lower risk of injury as well better coordination and body awareness. The earlier the focus on speed, agility & quickness (SAQ), the better the athlete will perform, both in and out of the water. If a swimmer can develop SAQ as a young athlete, they will have a much easier time advancing their athleticism as their career’s progress. Two obstacles to consider when training SAQ in young athletes is that natural athletic ability and neural function may vary greatly from athlete to athlete. While we are training our athletes to move quickly, athletically, and in an integrated fashion, we must always emphasize good form and mechanics. Multi-planar jumping jack matrix (Changing upper and lower body movements from the traditional exercises). *All of these exercises are great for improving coordination, footwork, and athleticism. 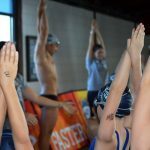 Increased focus on these fundamentals will vastly improve the athlete’s ability to produce power from multiple positions both in and out of the water. Bridging the gap between balance and athleticism is stability. Adequate stability from the foot all the way through the spine and shoulders is integral for maximal force production in SAQ work as well as the foundation for proper balance. Stability is one of the most important qualities to develop in swimmers, and something they should be working on throughout their careers. The more stable the athlete, the better their body position will be in the water, and the lower the risk of injury. In the earlier development of an athlete, it is important to reinforce the neuromuscular connection to help them understand how to engage the core effectively and appropriately. We want to introduce exercises that focus on anti-rotation, anti-lateral flexion and anti-extension of the trunk. *These exercises are incredibly important in developing a strong and stable core in our athletes. 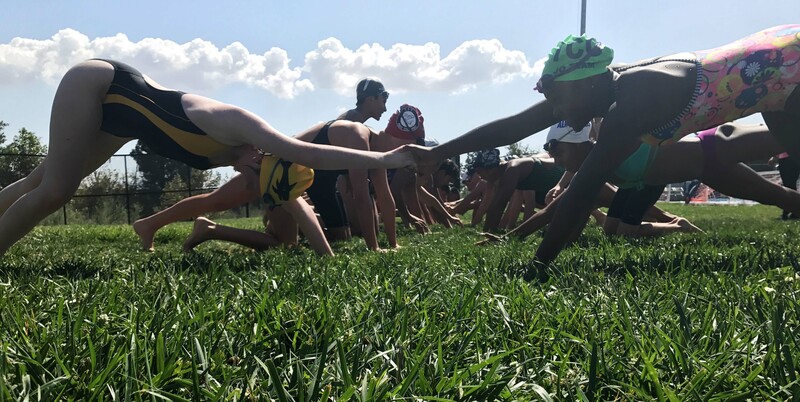 The stronger the core, the better the swimmer’s body position will be in the water and the more efficiently they will be able to produce power. It is of paramount importance that the athlete, parent, and coach recognize that a focus on these concepts at an early age is essential. Additionally, we must understand that this must be coached, cued, and progressed mindfully under a watchful eye. The more focus we put on developing better athletes at an early age, the safer and more productive their swimming careers will be. Book your next Fitter and Faster clinic with Lee Sommers to learn more about effective dryland practices!